The SB end in downtown Buffalo. To the right is also NY 5 for another block as it jogs west to get onto the Buffalo Skyway, so the "TO" is unnecessary. NB at a decorative overpass for the Scajaquada Expwy., NY 198. The WB button copy sign can be seen in the background, and there's plenty more where that came from on my 198 page (linked at bottom). NB with NY 265 through La Salle. NY 384 SB at I-190 (Exit 21/21A) just south of the western end of the Expressway, courtesy Doug Kerr. 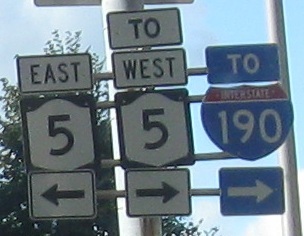 The I-190 onramp is connected with the Exit 21A (LaSalle Expwy.) offramp in the NB direction only. Why is LaSalle one word here but two words for the town? 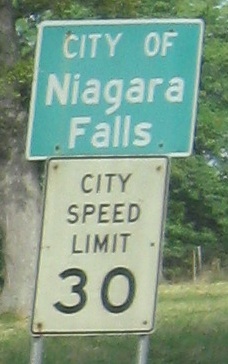 The now-standard but unusual elongated shield somewhere in Niagara Falls (maybe Niagara St.) at NY 384, courtesy Doug Kerr. 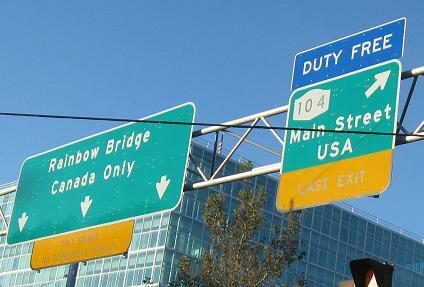 NY 384 ends and NY 104 begins at each other at the Rainbow Bridge. 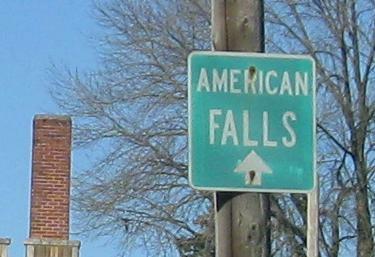 NY 104 is Main Street and does keep you in the USA, but Disney World may have a lawsuit on their hands. To Robert Moses State Pkwy.